Neglected for over a century now, this was the cemetery for the congregation of Maiden Lane Synagogue in Covent Garden from 1811, where more than five hundred souls rest peacefully. Surrounded these days by housing and enclosed by tall iron railings, it as an enigma to many in Mile End who have known it their whole lives. 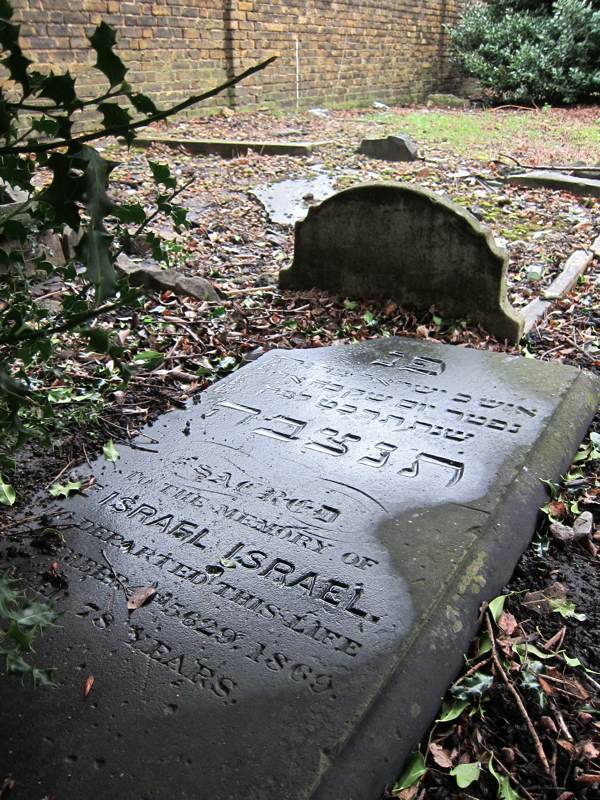 Lacking any sign to specify the nature of the place, only by peering through the railings and recognising the Hebrew upon the broken stones might the curious passerby discover it was a Jewish cemetery. 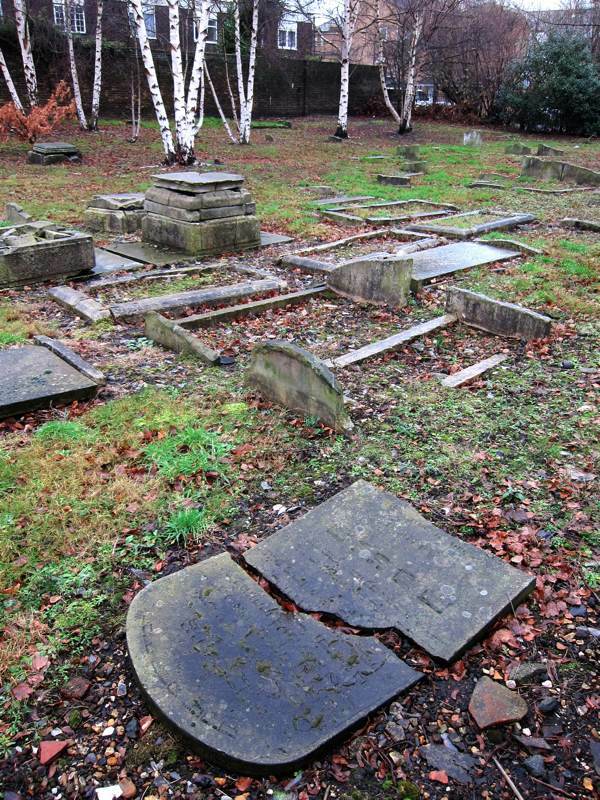 In 2008, architect Susie Clapham walked past and became fascinated to uncover the cemetery’s history and learn why it has been abandoned. After she unlocked the padlock and removed the chain to take me around the cemetery one rainy day recently, I was alarmed when a woman leaned out of a first floor window opposite and began haranguing us for being there, but – to my surprise – Susie was pleased by this reaction to our presence. “It shows that somebody cares about this place,” she said to me, reflecting her own mission to see the cemetery tended and cared for once more. 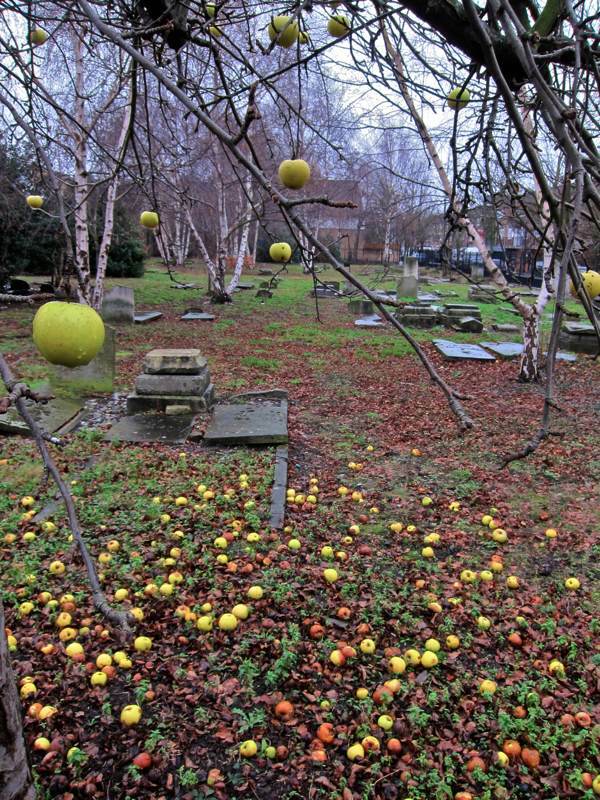 Just a couple of hundred yards west from Bancroft Rd is the Velho Cemetery, London’s oldest Jewish Cemetery, established in 1657 in the corner of an orchard. By 1724, this was full and became superceded by the Novo Cemetery on the eastern side of Bancroft Rd. Interestingly, these names reflect the high proportion of Portuguese among the Jewish community at that time. Thus when the Maiden Lane Synagogue chose the site for their cemetery, this area one mile east of the City was already established as a suitable location. 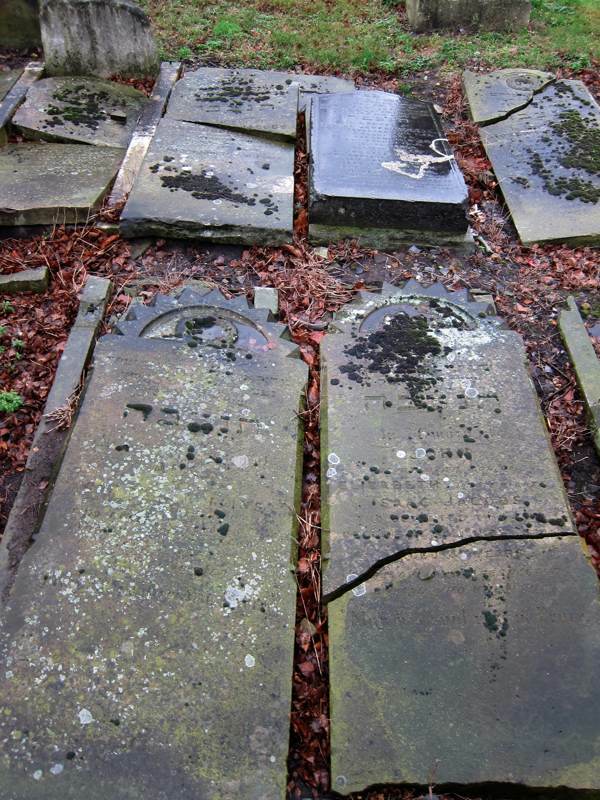 Since the demise of the Maiden Lane Synagogue at the beginning of the twentieth century, their cemetery has fallen into neglect and suffered bomb damage in 1944, scattering stones into disarray. 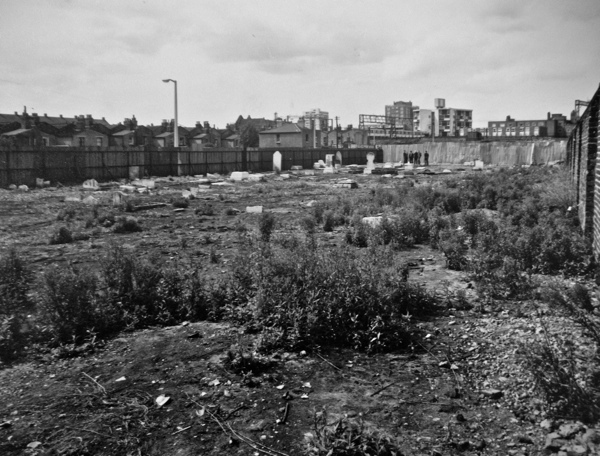 Yet the Board of Deputies of British Jews steadfastly refused requests to redevelop the site either as a public park or housing, even though a pile of correspondence and reports stretching back over the last hundred years testifies to the many attempts to quantify the decay and unsuccessful initiatives to restore dignity to the forlorn cemetery. In this densely populated area of the East End, the cemetery offers a rare patch of green. Susie Clapham would like to see a shelter built that would permit visitors to appreciate the contemplative nature of the location and where they could learn of the significance of the site and history of the long-forgotten who rest there, thus restoring the meaning of the cemetery to the fabric of the city. “It does not seem right that today, in the dark shadow of so much desecration and total destruction of cemeteries in Eastern Europe, and after the utter annihilation of our ancestors’ graves, this little place should be allowed to fall into such desolate abandon,” Susie told me, confirming that the Board of Deputies of British Jews has given its approval to her endeavour. Beautiful. A wordsmith as well as a photographer. I love the first photo of the apples like natures own Christmas decorations. Another great post very interesting .There are some great cemeteries in this country. I was particularly struck by the one in West Brompton .The work and dedication given to such a place of peace.They even have catacombs.I am surprised the coffins are still there.Thanks for your work keep them coming good luck. When the new Medical Sciences building for Queen Mary’s School of Medicine( the official title of Bart’s and the London Schools of Medicine) was constructed at Mile End in the 1980′s, it was partly built on a section of a Jewish burial ground. The stoneswere moved and cleaned, as were the bones and the remains reburied in the small section that remains. Since it is within the College grounds it is not officially open to the public but I am sure it would be possible to go and look. If I remember correctly the burial ground section lies between the existing building ( which I am not sure is still Medical Sciences) and the Law building. There may even be a sign, but I think at the time signs were discouraged because of fears of vandalism. 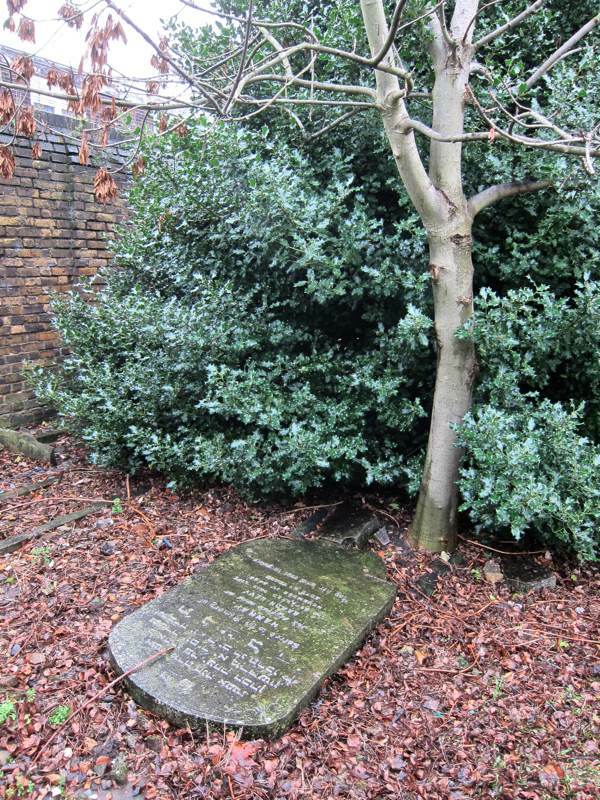 It is interesting to consider the extent of these burial grounds and what may be learnt about the demography of the Jewish population of London’s east end. As you say, the earliest populations were Sephardic, from Portugal ( Dr Barnado graduated from The London Hospital Medical college) and Holland, whereas later groups were from driven from Russia and Eastern Europe. And it looks as if Susie Clapham is about to mke it so – good for her. I frequently walk past on my way to visit wards at Mile End Hospital and have often thought to myself “This is one of those places that blog should mention”, so was pleased to see this. It has such a melancholic air about it. I’m glad that somebody is thinking about those that rest there. Love the picture with the apples! I do hope someone has photographed each stone and written down the name or names on it, put the information on CD, and given copies to libraries in the area – or that someone will be kind enough to do so, if it has not already been done. This would be a wonderful source of information for those who have ancestors who lived there, and are struggling to trace their families farther back in time. The people buried there should not be forgotten. 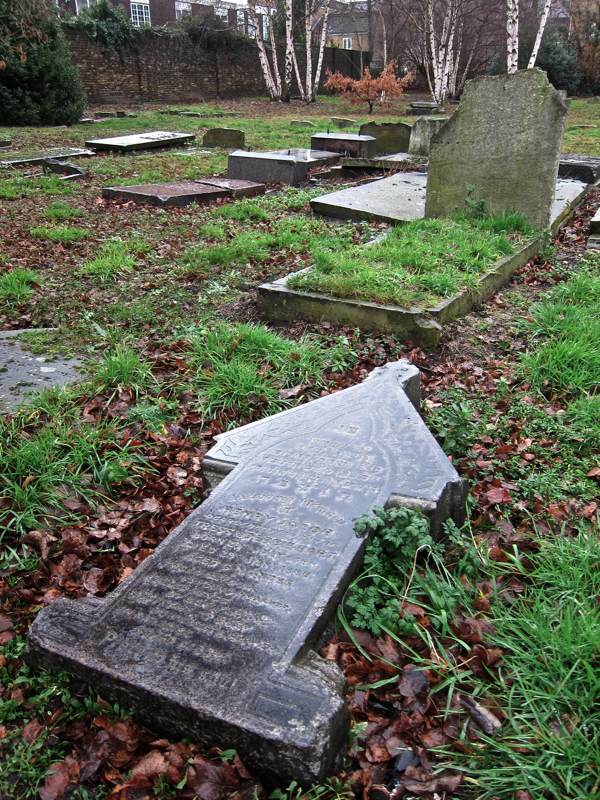 This small Jewish cemetery (as well as the Old and New Spanish-Portuguese Cemeteries also referred to) is one of the many cemeteries included on London Gardens Online, the website that makes publicly available the Inventory of the London Parks & Gardens Trust – now covering over 2,500 parks, gardens, squares, churchyards, cemeteries and other green/open spaces of historic interest across the whole of London. The Inventory is constantly updated as changes take place and new sites emerge, so I’ll look forward to updating the information on Bancroft Road Cemetery as Susie’s project takes shape, which I very much hope it will. This picture of the Jewish burial grounds broke my heart! I can not imagine why the people who pass this place don’t do something to restore it to it’s former dignity. Is there no shame in your country? Did our world learn nothing from what happned to the Jews. In my country we respect all people, dead or alive, no matter what nationality. Hope a hero comes along and rights this wrong. You are so right Sheila, … already as I saw the picture with the apples I thought, why people just forgot to pick the apples. Not long now and they will be completely gone! …. Please it does not let this happen that the graves completly fall into oblivion. Susie is to be applauded for her efforts. Of course, this beautiful piece of Jewish history, also part of London’s history, should be protected & restored. The mystery is why the Board of Guardians has not taken up the challenge to do so. Perhaps some of the wealthier North London synagogues can be persuaded to raise funds and/or labour to prepare the site for restoration. We are all guardians of our environment & shared history. I’d love to help with this project. I visited the Novo Cemetery yesterday on a walking tour of East End. Imagine my shock to find the tomb of my great great grandparents – I never knew they were there. Sorry to trouble you but I came across your e-mail address regarding Bancroft Road Jewish Cemetery. I have been trying to find the final resting place of Samuel Reuben who died in the Whitechapel area in May 1915; he was born in 1907. It is a long shot I know but it may just be possible he was buried in Bancroft Road and you have seen his headstone there? Hi, my wife and I visited the Velho cemetery yesterday to pray at the gravesite of the great Rabbi Refoel Mildulah of blessed memory, who is known to have performed miracles in life and in death to those who are in the need. Although we had made an appointment with the secretary of the synagogue/cemetery office to be able to have access to the cemetery, it had nevertheless taken us nearly two hours to be finally admitted in to the cemetery, due to security and building work that is currently taking place around the cemetery site. Being that it was the first time that we were visiting this cemetery, it was an emotional and touching experience that left us both inspired. But it also left us feeling sad and dismayed as to why the oldest and prestigious cemetery is being neglected. On our visit to the area, we also paid a short visit to the Novo cemetery, where we felt the same sentiments as written above. 1) these historical Jewish landmarks would be restored and maintained in a respectful manner either by the Jewish community or by the local authority. 2) that access to the cemetery sites would be easy and welcoming for those who want to pray and pay their respect. I am hoping someone out there will be reading this, and who knows, maybe something positive will come out of this correspondence.